Traveller, RN, doula, passionate about horses, outdoors, photography, quilting, yoga, coffee and chocolate. I set off in the morning for an adventure to Rainbow Valley, while Ellen rested her sore foot. My group was quite small, just 8 of us, including a very lovely Swiss mother and her grown son. Barbara, the mother, was very talkative, describing herself as a ‘happy retired lady’. She told me that she used to help her dentist hubby when he first opened his practice, though she had no experience as a dental assistant, and she thought every day of divorce during this time, haha! She said when he got a real assistant and she could just do the books, it was much better. When I commented to her that Swiss chocolate is very delicious, she said ‘It’s ok.’!!! A real card, that one. Our guide was rather talkative, which is always nice. When they are a hand talker and also your driver however…sometimes a bit scary! No, truth be told, I’ve had considerably scarier rides, any city bus at all that I rode in China, for instance. We also picked up a hitchhiker along the way, an older man, who it was translated to me, as an itinerant worker, had been walking for 8 hours to find work. Yerbas Buenas is a 7000 year old large amalgamation of rocks/large rock formation. It was originally a place to stay for travellers and now is simply notable for its beautiful petroglyphs. There are many drawings here, many of which tell a story about the times past. They are simply fascinating to look at. One of the mystery pieces – lizard? Rodent? Our guide delighted in telling us about some of the local plant life as well. The ricarica, good for breastfeeding and digestion, and the pingopingo, from the Ephedrina family, known as the ‘Atacama Viagra’ but good for urinary infection too. Apparently this is no where near as strong as the Chinese strain of the plant, and you should select the fourth section up from where the leaf meets the main stem, as it has the highest concentration of the effective substance in it. He also pointed out a cactus, whose flowers are high in Vitamin C, and were therefore eaten and used to keep scurvy away. This cactus is fondly called ‘the mother-in-law cactus’! Our next stop was just a short ways down the road. Rainbow Valley, as it is known for the myriad of colour found in the rock, is an estimated 240 million yrs old. Our guide told us that it was originally formed from a magma chamber. The various colours are due to the different minerals in the rock and dirt. We also visited a rock formation that was very reminiscent of Antelope Canyon in Arizona, or the grand entrance to Petra in Jordan, albeit in miniature. Our guide provided us with a snack and we took the opportunity to get to know our group mates a bit better and get into some deep discussion with our guide. He was telling us about how the president of Chile is really ‘just a puppet’ for the 8 families that essentially own all of Chile (business, land, etc). He said that he was originally an architect, but to practice as an architect in Santiago, he would have to work for one of the major companies and just continue to feed into the wealth of the major players. 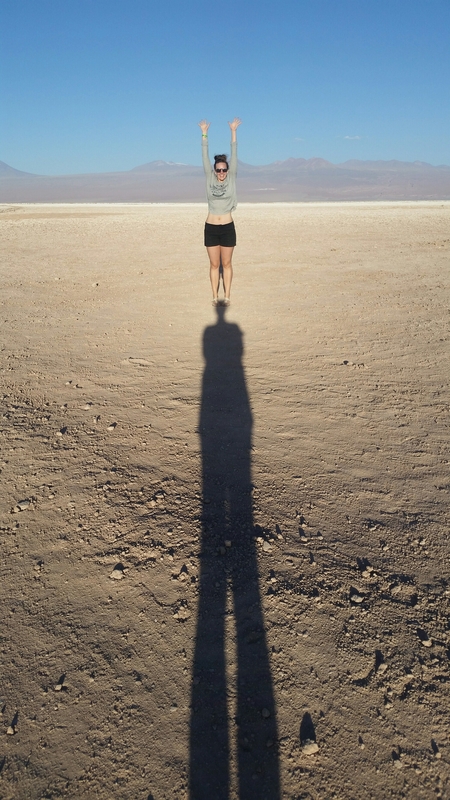 He didn’t want to do this, and so decided to move his family to San Pedro de Atacama, and go as ‘off the grid’ as he could. He said that they power their home with solar panels, don’t have a tv, buy local/organic, send their daughter to an alternate playgroup rather than a government run preschool, and do whatever else they can to make their money count as their vote. I loved this, as it is how I want to live and try to live, and it’s fascinating to see this feeling mirrored on the other side of the world. Our afternoon tour was considerably bigger with a whole busload of people, though we did get to know a lovely Irish couple, who had lived in Vancouver for a few months. It’s truly a small world. Our first stop was the 3 Marias, although now technically known as the 2 1/2 Marias. It was originally also used as a resting place. The reason they are now the 2 1/2 Marias is because a few years back a tourist stood on one of them and broke it off. We asked what had happened to the tourist who broke it, thinking it would have been a huge fine and deportation for sure, but he received only a 100 dollar fine! I’m the 3rd Maria/Death glare at the people encroaching on my photo. We climbed up a steep slope to the to top of Achachas, a sand dune/rock formation. What a beautiful 360 view! Our very funny guide Simon told us volcano story about the two brother volcanoes Licancabur and Juriques, who stand side by side. Licancabur is the ‘perfect’ volcano, with symmetrically sloped conical sides. Juriques, on the other hand, appears to have been lopped off in the middle, and to the other side of Juriques is an empty spot, exactly mirrored across the valley with a ‘female’ volcano, Quimal. Quimal was supposedly Licancabur’s girlfriend/fiancee, originally located on the same side of the valley as the other two. When Juriques began flirting with her, the father volcano down the valley, Laskar, erupted in anger and chopped Juriques’ head off and moved Quimal across the valley from the boys. A cautionary tale on the dangers of promiscuity to be sure! After a quick exploration of a cave, studded with mineral crystals, we headed back to town for a well deserved rest! 5. Headlamp for exploring caves. 6. Scarf for when the wind is throwing sand in your hair and eyes and also for when it gets cold at sunset. 7. Snack although there are empanadas and water at the main entrance of Moon Valley if needed. I don’t think other destinations like the lagunas and Valle Arcoiris have snacks though. The theme of the trip so far seems to be early morning wake up calls! Our flight left for Calama at 0645 so we had to leave for the airport by 0445. Zzzzz….. We used the same shuttle company we used to come in to town and they were very professinal and prompt. Allow time to pick up other passengers, although the shuttle company is usually quite good at coordinating it. 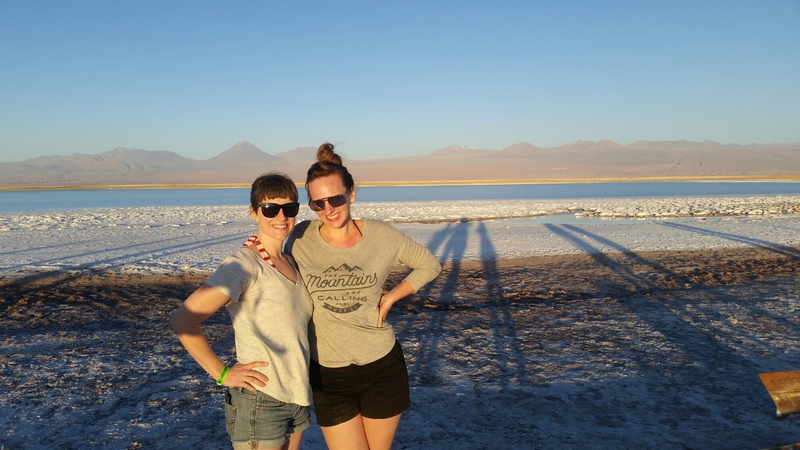 We got to Calama bright and early and easily picked up one of the transport services to SPdA. 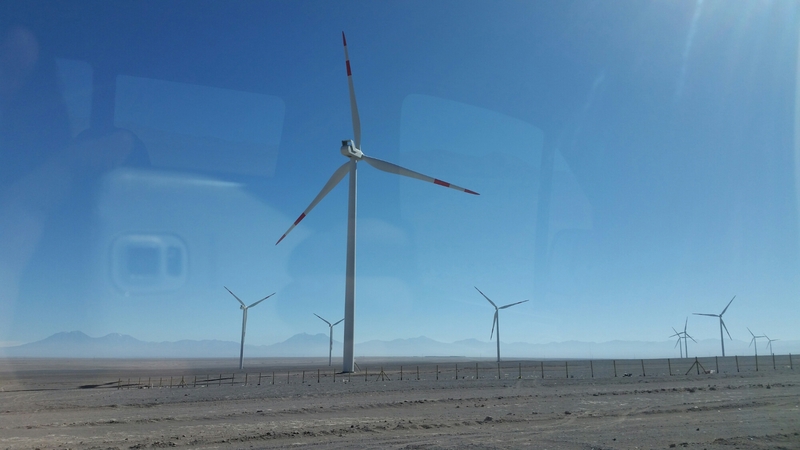 The desert is a perfect place to capture wind power and there are a lot of windmills on the way to San Pedro. The driver didn’t speak English but was very friendly stopped for a view point just outside of San Pedro. He dropped us off directly at Hostal Mamatierra. This is one of the top rated hostals in San Pedro and it’s not hard to see why. It is very clean, not too big, not too noisy and there was a towel and water provided and they helped us to book all our activities while we were there. We went into town to run some errands. San Pedro is very cute and small but busy with lots of tourists. I had a delicious lunch of guacamole wrap and learned ‘palta’ is a kind of shortened way to say avocado. 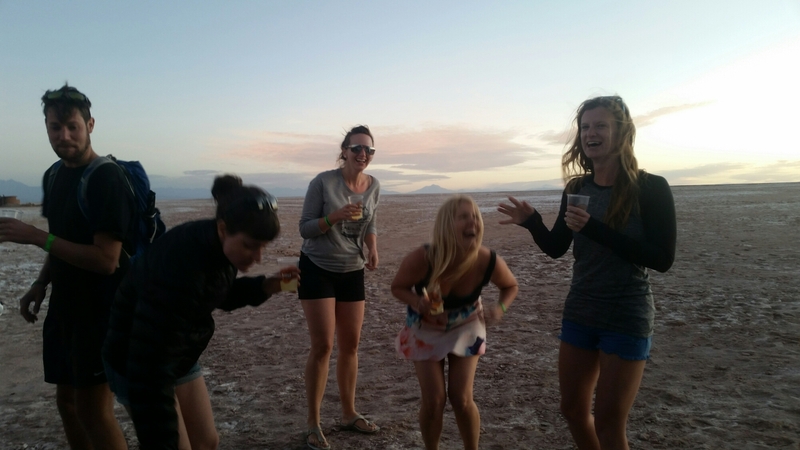 That afternoon we joined a tour to see some of the salt lagoons with a few Aussies from our hostal and others. It was really lots of fun. 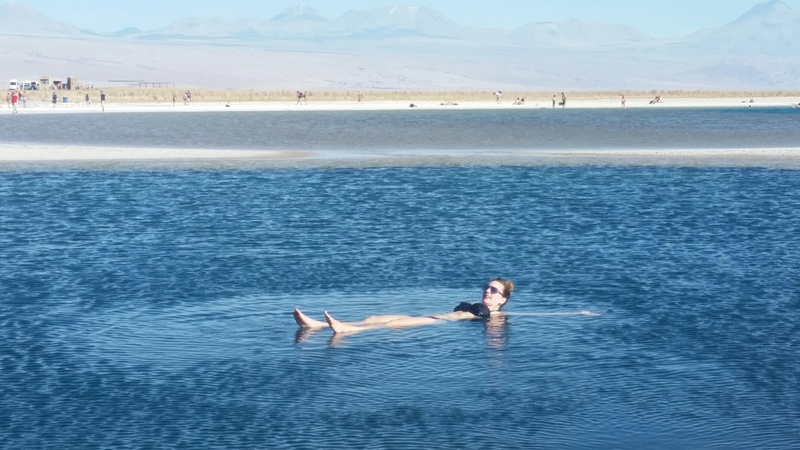 Laguna Cejara is not for floating in but was gorgeous. The pool we were allowed to swim in was not as salty as dead sea but quite cold. 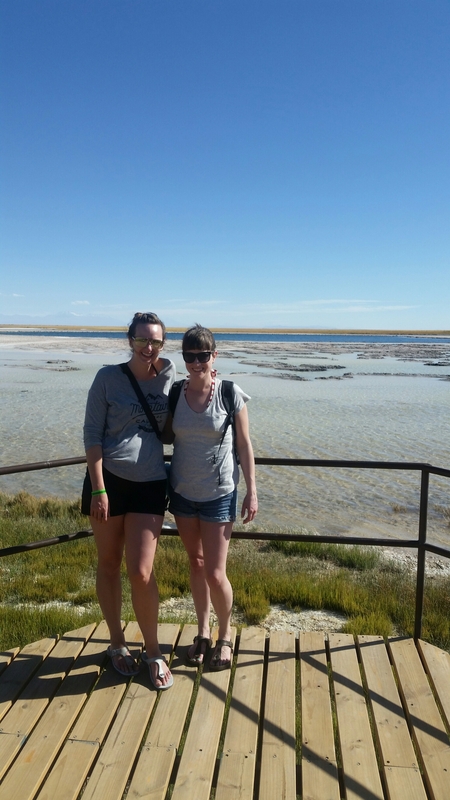 We saw our first flamingos here! They are just beautiful and look like planes when they fly. We also saw all white flamingo which we promptly nicknamed ‘Albingo’. 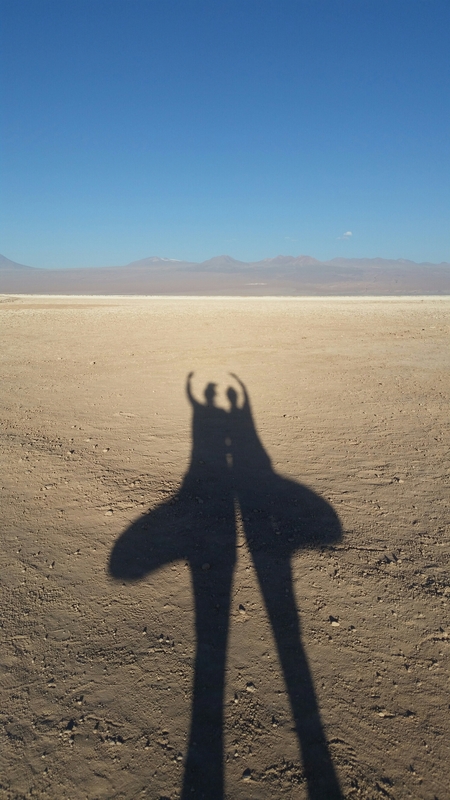 From there we drove to another pool that we could swim in and took shadow photos in the setting sun. 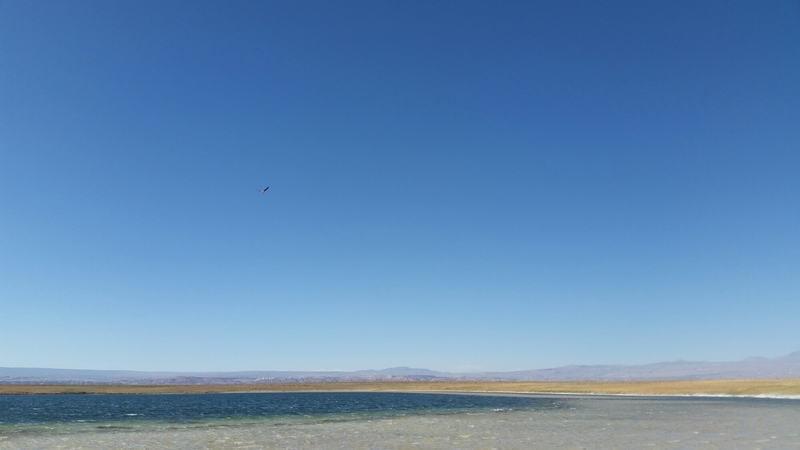 Lastly, we visited Salar de Atacama and saw more flamingos. I almost lost my swimsuit top. Don’t worry, wasn’t wearing it, but had tied it to my bag to dry out. Luckily it was quickly relocated! 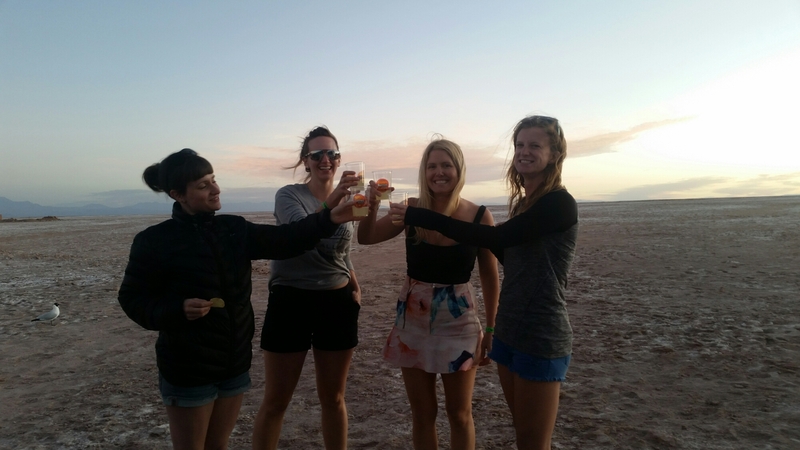 We also tried our first pisco sour. They were delicious! This resulted in lots of giggles with the girls. The desert gets quite chilly at night and we were pleased to return home for delicious fresh tomatoes and avo for supper. I set off for a wonderful adventure back to the East Coast to visit my nursing school friends and Jeramy’s family. The East Coast is beautiful in the fall, it is absolutely my favorite season on the whole and especially spectacular in the east. The West Coast is majority big old Dougie firs, and cedars, the evergreens, that make up the rainforest; but the East Coast, on the other hand, is a patchwork of reds, greens, browns, yellows, and golds, spread thickly over the rolling hills. No mountains here, this is pastoral, open land. I started the trip out in Fredericton, the city where I met Jeramy, went to nursing school, started volunteering at therapeutic riding, and trained for my first half marathon. I never thought that I would say this, but I do miss Fredericton. If the hospital there was a bit nicer, I just might consider living there again. I had a fantastic visit with nursing school friends, tried Chess Piece Cafe (yum! ), picked apples at Everett’s Orchard, did some classes at Moksha Yoga, saw my amazing doula friends, met a whole heap of new babies, saw a few of my old profs, and did some shopping at my old Le Chateau. It was so incredibly lovely and I definitely felt nostalgic and sad to leave. Apple picking with Laura, my fave running buddy. We trained for a half-marathon together! After that as a few days in Moncton over the weekend, with Jeramy’s parents. It was great to spend time with them and their 4 dogs, all Gordon Setters. We didn’t do too much the first day, just hanging out, and Jeramy and I did some shopping in the afternoon. I also got to take a ride in the sidecar of his stepdad’s Ural motorbike. I have a goal to ride as many kinds of transport around the world as I can. This was my first time in a sidecar! Jeramy’s parents were going to a dinner that night where his mum was going to receive an award for her incredible work with education of everyday people about hands-only CPR. Very proud! Jeramy and I went to the 3D showing of Pan, which was good as far as costumes, music, and graphics but the storyline was a bit off compared with the rest of the stories. The next day we set off on an afternoon adventure to Martin Head Beach via Alma. Alma is a tiny village along the Fundy coast, notable for delicious sticky buns and seafood. Martin Head is down the coast from Moncton, past Hopewell Rocks, down a nicely graded dirt road which turns into a bumpy logging road, which turns into what can best be described as a washed out creek bed at a 15% grade. Wheeee! The beach was beautiful, set along a rugged coastline with cliffs abruptly diving down to the ocean. When the tide is low, you can cross over to the spit of land that leads out to Martin Head itself, which unfortunately was not possible at the time we went. It was such a beautiful day though and with the Fundy Footpath crossing along here, it would be awesome to come back. Martin Head is also a UNESCO Biosphere reserve, and it’s not hard to see why. It feels so remote, so serene, and so untouched. There are many birds around and no real predators. Beautiful grays and golds as sunset begins. My next day was spent going to Saint John to see Gloria, my former roomie, and Emily, a former classmate and fellow doula. Always nice to see friends! Jeramy and I set off for Halifax the next day. I got to see the beautiful and wonderful Leah, and she took me into some beautiful little shops and the new Halifax library for a ‘blueberry fog’ (yum!). The new Halifax library is beautiful and very optimally situated and has a great view of the city. We had a delicious dinner at one of the Korean restaurants, kimchi jeon, kimchi chiggae, bibimbap….so good! Our next day consisted of similar: eating delicious sushi at Sushi Nami with our friend Rachel, shopping at Biscuit General Store, and having afternoon coffee and salted caramel brownie at Apothecary. 🙂 dinner that night was at The Stubborn Goat, sharing a variety of tasty treats like lobster mac n cheese, deep fried avocado, and chickpea fritters, to name a few. That night Jeramy and I celebrated our 4 year anniversary. We rented a hotel room and drank wine, ate cheese, and generally enjoyed just taking some time with just us in the craziness of visiting. We drove back to NB the next morning, Jeramy taking a moment to drive me through Halifax Airport – silly guy! We ended up in Cap Pele for lunch at one of the local seafood restaurants with his mum and took the scenic route along the coast to get back to Moncton. The next couple days were just filled with visiting, eating, walking, and enjoying being there. Highly recommend a trip to the Maritimes – everyone is so friendly! Who am I when I’m not on the road? I’m sitting here in our basement with the wood stove crackling merrily away, binge watching Gotham (hello, Ryan! Oh, do you not go by that outside the OC? ), drinking Davids Tea (Cranberry Orange Muffin), and cutting fabrics for my new quilt. When I’m not travelling (or spending time planning a trip), I am usually keeping myself quite busy. 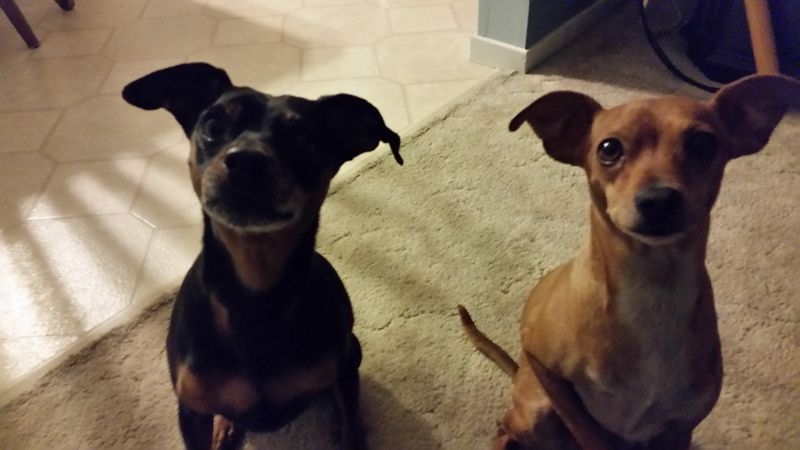 Apart from being an RN, which keeps me busy for four 12 hr shifts a week, I’ve got two dogs, Newman, 3, a Minpin x Italian Greyhound, and Mac, 6, a Minpin. We like to adventure around our home in the Kootenays of BC, where there are lots of mountains and trails to explore. I try to document our times via Instagram (@trnscontinental) to promote the beautiful area we live in and to remember the beauty in the future. 2 quilt tops recently (see below), have one cut, and have just started cutting another. I’m told I’m not permitted to just collect quilt tops however, so I’ll have to start actually quilting them soon I suppose! I’ve got 2 pairs of PJ pants on the go for myself, some Christmas napkins, and a couple other little Christmas present projects. Always lots of fun to create something new by hand. Like to think it’ll help keep me from getting Alzheimers! Another quilt, fully put together and awaiting quilting and binding, and two sets of napkins. 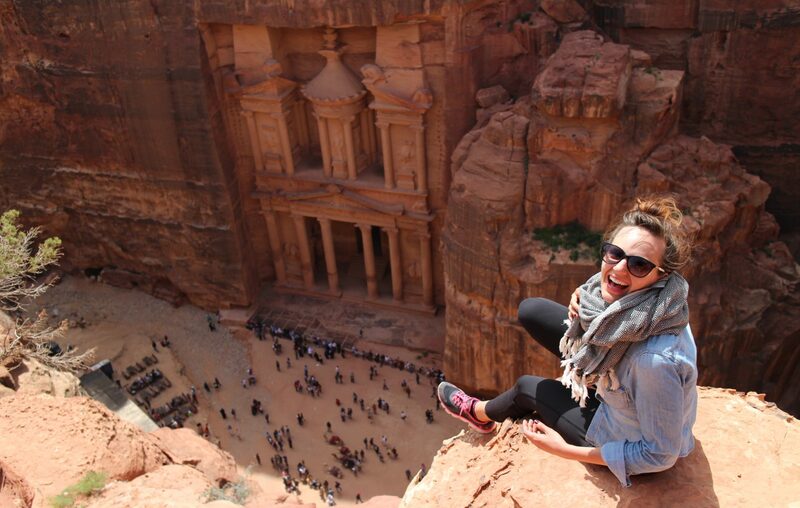 Yoga, horseback riding, reading, card-making, and studying languages are also fun. I like using Udemy and Duolingo to study, although I have about 4 different Korean language apps on my phone. I’m losing my Korean, as I’ve lost my French and Japanese, so studying on my lunch break helps a bit. How do you learn new languages best? What do you do in your spare time, when you’re not working or travelling? And yes, Netflix, Shomi, and I are pretty good friends. After travelling and being surrounded by noise, new people, and new places, being home alone is too quiet for me!